The National Institute for Occupational Safety and Health (NIOSH) conducted the first comprehensive survey of the U.S. mining population in more than 20 years. 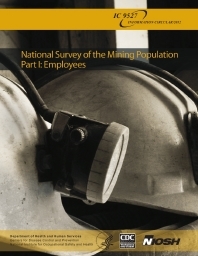 The National Survey of the Mining Population captured the current profile of the U.S. mining workforce. Data collection began in March 2008 and continued through August 2008. Randomly selected mining operations in all of the major mining sectors (i.e., coal, metal, nonmetal, stone, and sand and gravel) received the survey and had the option of completing a paper or web-based questionnaire. A total of 737 mining operations returned completed questionnaires and reported data for 9,008 employees. Two sets of data were collected in this national survey. There were questions about the mining operation, including employee training, work schedules, the use of independent contractor employees, and mine communication and safety systems. The employee questions included demographic and occupational questions about individual employees. The survey sample data were weighted in order to provide national estimates of mine and employee characteristics. This Information Circular (IC) is published in two parts--"Part I: Employees" presents the employee-level data and "Part II: Mines" presents the mine-level data. Both parts of this IC include an overview of the survey background, development of the survey materials, sample design and sample selection, data collection and processing, statistical weighting, and lessons learned. The survey data are summarized for the overall U.S. mining industry and the five major mining sectors. The information gathered from the survey respondents is being published only as summarized data so that no single mining operation or employee can be identified. Authors: LJ McWilliams, PJ Lenart, JL Lancaster, JR Zeiner, Jr.